Parcel delivery, and airport service. 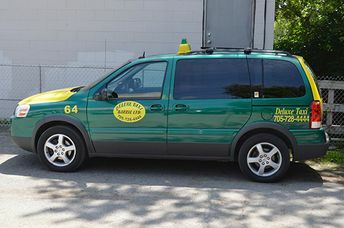 Deluxe Taxi has been helping Barrie get around since 1947. That's over 65 years of reliable service! From a trip to the airport to a trip to the mall, we're available 24 hours a day, 7 days a week, 365 days a year to get you where you need to be safely, affordably and on time. We also provide parcel deliveries, battery boosting and long-distance service. Please call us to request a cab! Barrie and the surrounding areas are full of things to do while you’re in town, and Deluxe Taxi would be happy to help you get there! Check out our local resources to help you figure out what to do for the day, weekend or week ahead.